Jicama isn’t the easiest thing to find in Montreal. I went to every grocery store, fruiterie, and Latin themed shop I could think of. In the end I tracked one down at a Mexican grocery store about a block from my place. I had no idea it was there. For all the effort that went into finding it, I wasn’t overly impressed. Jicama looks cool, kind of like a gigantic radish, but I didn’t like the flavour much. It’s a bit sweet, but also very raw potato starchy. It left me with an unpleasant tingling in the back of my throat and a slightly numb tongue. I’ve never had jicama before, and I don’t know anything about it. Perhaps I ate it under-ripe? Or maybe that’s just what jicama tastes like? My dining companion has tried it, and says she preferred it cut up into little matchsticks tossed into a salad. The big spears were a bit overwhelming. I remember Harold on the first season of Top Chef was obsessed with the stuff, so I was happy to try it, even if I don’t see what he was going on about. I find it hard to rate this recipe, because it’s principal ingredient is so unfamiliar. Luckily this dish also included cucumber spears tossed in lime juice, chili powder, cayenne, and salt. I thought this treatment worked pretty well for the cucumber, and made them a fairly addictive little snack. It did little to improve the jicama in my mind. I appreciate the simplicity of this dish, the lime, chili powder, cayenne, salt dressing packed a big flavorful punch, and the dish can be put together i well under 10 minutes. 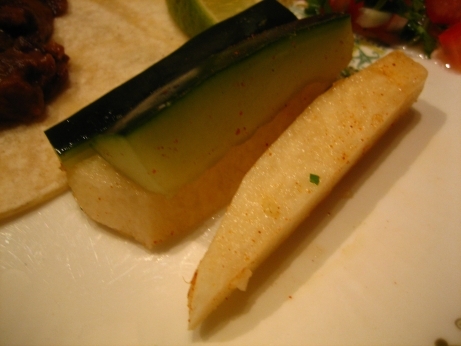 I think I’d put the cucumber spears out at a summer garden party, but I’d drop the jicama. Looks cool but didn’t have a good flavour? Reminds me of our experiment with Pokefruit. I don’t trust any of that pokefruit. Especially star fruit. It’s awful, but shows up in fruit platters all the time because it’s so pretty. New reader and fan here. Jicama is really popular where I live (México, so duh) and I love it. Your take on the flavor and texture is about right, kind of like raw potato only crunchier, definitely not as starchy and a little sweeter. If you didn’t like it the first time, you probably should just cross jicama off your list. Here it is common to be served a plate of jicama, cucumber and carrot sticks, dressed as you describe, to nibble with your beer, or while you wait for dinner. A mix of ground red chile and salt is sold everywhere in shaker containers to make this easy! Some of my friends use little slices of jicama in Chinese stir fries to sub for the water chestnuts we can’t buy. Same kind of flavor, or none, and texture. I will be following the progress of your project. Thanks, sorry this is so long. Thanks Dee. I think I’ll give Jicama another try before I completely write it off. I’m really glad you’re enjoying the project. Hi! I was surfing the net and found your blog post… nice! I love your blog. Cheers! Lindsey. M.